Review The PS3 Slim sees Sony hoping to invigorate sales of the Playstation 3 with a lighter and much less expensive model. No doubt the company views this as a chance to redeem the brand before it starts to look like a fat old aunt in the console war. For this redemption to take place we would need to see some serious new features go into the rebirth of this gaming console. Design was obviously foremost in Sony’s mind; this console is at least a third lighter and smaller than the old “fat” version. It certainly looks like an upgrade. Image may indeed be a major deciding factor to the casual gamer and possibly give it a wider audience. Regardless, it is obvious this has been one of Sony’s main goals during research and development. It really does look modern and classy and it would be a welcome addition to my home entertainment shelf. The new textured or matte finish certainly helps show less fingerprints and looks less dated than the previous shiny surface. I have my old PS3 sitting vertically but it is obvious that with the new slim model they expect you to have it horizontal. Even with this change, it is still small enough that it will fit into an area with limited space. In a very subtle but well thought out branding revamp, the PS3 logo and lettering have been slightly changed. They have replaced the touch sensitive power on/off and eject buttons on the front of the unit with standard push buttons and moved the main power switch to the front. This new front button is faster and doesn’t take as much force to turn the system on and off. This improvement definitely adds to the overall sleekness of the design. 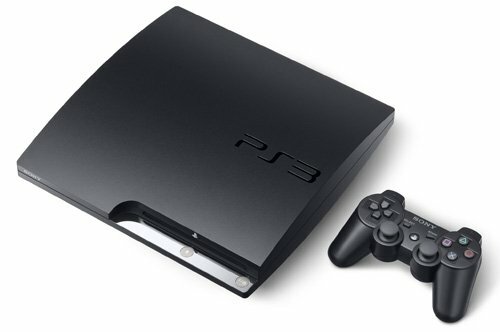 When it comes to features, the 120GB Slim PS3 is almost exactly the same as the 80GB and 160GB PS3 models. There is still built-in Wi-Fi connectivity, two USB ports for plugging in external storage devices and charging the PS3's Bluetooth wireless controller, you get one Dualshock 3 controller with the Slim, and the same built-in Blu-ray player. For its price, and as part of this console, this is still an excellent Blu-ray player. Indeed, with less power running through it, the Slim PS3 is a lot quieter and more unobtrusive. While watching Blu-ray titles, you wouldn’t even notice it was on unless you were sitting right next to it. Less power also means less heat, so no burnt fingers when changing Blu-ray discs. Incidentally, Blu-ray disc loading times are quite good too. It varies according to title, but easily under 30 secs and with some discs, nearer 10 secs.